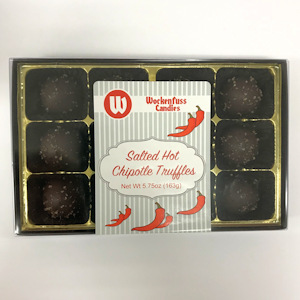 Our bite-size gourmet truffles have a rich and smooth dark chocolate ganache center, protected with a delicious chocolate outer shell – this box has the perfect combination of sweet and spicy! Bite-size truffles are 1″ in diameter. Semi-Sweet Chocolate [Sugar, Chocolate Liquor (processed with alkali), Cocoa Butter, Milk Fat, Soy Lecithin (an emulsifier), Vanillin (artificial flavor), Natural Flavors, Vanilla], Heavy Cream, Corn Syrup, Chipotle Salt (sea salt, ground chipotle peppers), Natural & Artificial Flavors, Invertase, Potassium Sorbate (preservative).